Then of course are those mornings I wake up with that familiar sense of foreboding and convince myself Mercury must be retrograde. I check my calendar. It is not. All is well no matter what it feels like…. This has made me realize that the whole experience often referred to as “life” is an incredible roller coaster ride, full of seemingly ‘never-going-to-make-it’ uphill climbs, only to come crashing down in such a way that my stomach feels as though it has become dislocated. It’s not Mercury; it’s life. 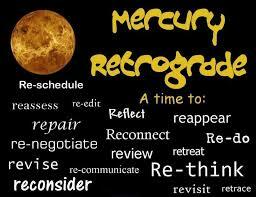 We just have this handy escape mechanism that we refer to as Mercury Retrograde because it gives us the feeling of eventually culminating and then ending…. But have you ever gotten through a retrograde only to feel that it’s not over at all? Life is not to be feared. We didn’t come here to fear our daily occurrences; we came here to create them according to our individual desires, and to co-create some really cool stuff with our fellow inhabitants in this time and space. Together, we created this very normal astronomical event (that is not an incorrect term; it is indeed astronomy and not astrology) and gave it attributes that may or may not be true (that part is astrology and not astronomy)….but what IS true is that our Creation was never meant to be feared. Our Creation was meant to be celebrated. We are shifting. Energetically we are becoming a new species. These shifts, I suppose, can be a little scary as we are traveling into unknown territory….but isn’t it all unknown? Isn’t every single day–when you really think about it– “unknown territory”? After all, we haven’t been here before, and who knows what the new day will bring? I think the shifts are exciting. They excite me because they confirm everything we were ever taught about this time and place and our role in it. C’mon people, stop being scared and let’s play ! 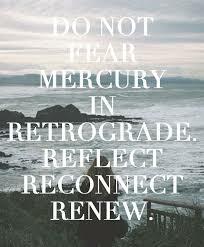 So….if this is the case….and it most certainly is according to my celestial guides…..then perhaps we need to take another look at what Mercury Retrograde means because in all actuality, if something in our Universe feels fearful to us, then it is not the Universe’s fault. We are doing it all by ourselves. The Universe does not create fear; we do. It does not mean bad luck. It does not mean to beware of that, this, or another thing. It does not mean for us to hide away, with the covers pulled over our heads and bury ourselves in chocolate for the next three weeks. And it most certainly does not mean for us to say ‘no’ to life in whatever way it presents itself to us at that time. There now. Doesn’t that seem a whole lot less threatening? Less scary? Less fearful? Less victimizing? More self-assertive? More life-affirming? More in control? More enlightening? I think I’m even looking forward to Mercury Retrograde this time around, simply….if for no other reason…than my faith that……..